Every spiritual seeker needs space and time for quiet reflection. We usually have in common appreciating the value of a daily discipline of quietness, but we all do it in different ways and resonate with different philosophies, methods, places and people. We can enhance the benefits of daily practice by taking or creating opportunities to “retreat” from the world for deeper immersion in our spiritual principles over an extended period. Occasional or regular Retreats of anything from one day to a few weeks can be re-energising or even life-changing. 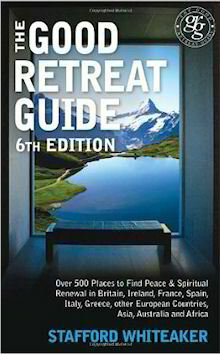 I have had a wonderful journey along the way to creating Europe’s best-selling book on spiritual retreats, The Good Retreat Guide. If you want new values, alternatives to materialism or simply some rest and relaxation, please visit the The Good Retreat Guide Online and search according to your preferences. A dedicated team supports me in keeping the information going and making the site ever more useful. We will welcome your feedback once you’ve experienced your retreat!